IP-10 (CXCL10) human in vitro SimpleStep ELISA® (Enzyme-Linked Immunosorbent Assay) kit is designed for the accurate quantitative measurement of IP-10 (CXCL10) protein in human serum and plasma samples. C-X-C motif chemokine 10 (CXCL10 or IP-10) is a small 10.8kD protein that is secreted by several cell types in response to interferon-gamma (IFNg). These cell types include monocytes, endothelial cells and fibroblasts. Upon secretion, CXCL10 is cleaved into an 8.7kD biologically active protein to function in chemotaxis for T-cells, NK cells, monocytes/macrophages and dendritic cells. In addition, CXCL10 has antitumor activity through the inhibition of bone marrow colony formation and angiogenesis. CXCL10 elicits its effects by binding to the cell surface chemokine receptor 3 (CXCR3). Chemotactic for monocytes and T-lymphocytes. Binds to CXCR3. CXCL10(1-73) is produced by proteolytic cleavage after secretion from keratinocytes. Our Abpromise guarantee covers the use of ab173194 in the following tested applications. Example IP-10/CXCL10 standard curve. Background-subtracted data values (mean +/- SD) are graphed. A new standard curve must be generated for each assay performed. Titration of PBMC conditioned media (+/- PHA) within the working range of the assay. Background subtracted data from triplicate measurements are plotted. Data shows specific secrection of IP-10 (CXCL10) by human macrophages differentiated in culture for 3 days in a dose response to M1 (MCSF + IFNg). ab173194 has not yet been referenced specifically in any publications. Publishing research using ab173194? Please let us know so that we can cite the reference in this datasheet. the kit is very sensitive and specific. 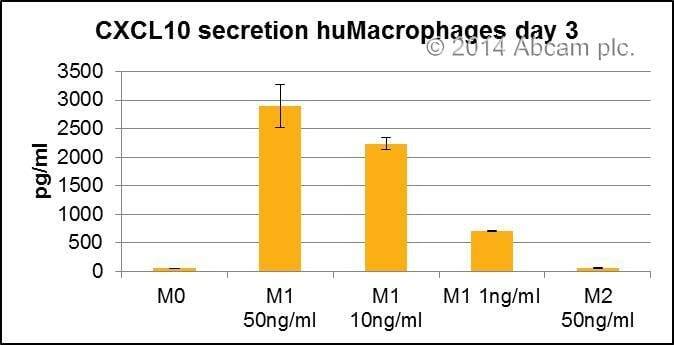 data shows secrection in a dose response by M1 (MCSF+IFNg) human macrophages differentiated in culture for 3 days. Regarding speed, it took me about 2hrs to run the assay, very much time saving considering a minimum of 5hrs for the standard ELISA. Money wise, price is more or less the same as a standard ELISA. Something interesting is the volume required is 50µl versus the 100µl of a standard ELISA.